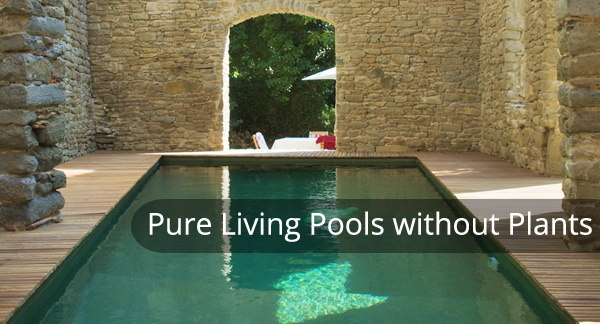 Pure Living Pools are completely chemical free. We use a living biological bed of micro organisms that purify the water as it passes through. A nutrient absorber material replaces plants to naturally extract phosphorous that would otherwise let the pool go green with algae. 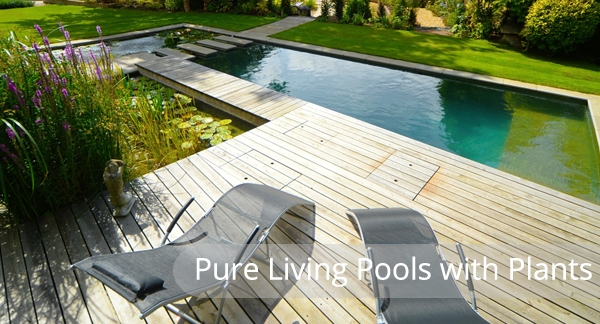 Pure Living Pools are built using our partner Biotop’s award-winning “Living Pool System”. The water is crystal clear and it is purified naturally in cycle again and again. There are no potentially toxic by-products such as chlorine, bromine or ozone, or ionised heavy metals such as copper or silver. An automatic robot cleans the pool floor and sides each day. Pools can be covered, heated naturally or with renewable energy (up to 30C/86F), or built indoors . Your skin will feel soft, and you can breathe easily with a clear head – and your hair will never turn to straw or go green again! Without plants this is the only truly natural chemical-free swimming pool available on the market today. The Biological filter which runs gently round the clock is separate from the swimming area and is covered to prevent sunlight causing algae and plant growth. During day time pool water is pumped rapidly through ultra-fine steel mesh skimmers which replace the sand filters in a conventional swimming pool. For more consistent water clarity we use ultra-violet light. This naturally kills free floating living algae cells and germs without killing the filter bed. Copying nature as it works best. Beautiful, balanced and low maintenance swimming pools with water plants. Plants can be added for a more natural scene and add ecological balance. There will be more wildlife such as dragonflies flitting about, and swallows dipping. Plants grow best if planted in a special clay either completely separate or adjoined to the swimming area. Oxygenators and lilies are planted in deeper water, then flowering marginals such as iris and marsh marigold can be added at the edges. The biological filter can also be left in the open and planted with reeds.